Anyone remotely interested in sound-engineering or music-production, be it contemporary or classical, should be familiar with the North West's answer to Joe Meek, Martin Hannett. During his short life (he was just 42 when he suffered heart failure at the hands of booze and self-destructive drug-habits), the producer arguably shaped the sound of Manchester and, some may argue, the British music scene. Whilst I cannot disagree with how important Hannett was and still is, it was to be another 15 years after his death before the wave of Editors-clones truly paid homage to the wizardry of Martin 'Zero'. "Maverick......" is archived sweat and tears, pulled together from years of sound-desk out-takes and by curator and researcher, Chris Hewitt and son Tom, founders of Ozit Morpheus Records, the label behind this double-disc package. As with the previously issued "Personal Mixes - Joy Division", the recordings here are rough, intimate and bordering on geek-like completism - at once engaging and frustrating, there is nothing in the way of finished music on these CDs, just experimental passages featuring himself or with selected Factory acts and pre-Rabid arrangements with a brace of local artists including Belt and Braces (twee folk-rock), Pete Farrow (rather engaging singer and songwriter in the Ray Davies mould) and George Borowski (gutsy commentary and strummed guitars). Completists should form a queue here, although there is little evidence of Hannett's future obsession with modulators, delays, effects and ARP synths, or the infamous 'smash-snare' sound that propelled later work. Of particular interest to Factory aficionados are the brief chunks of reworkings of Durutti Column's "Self Portrait" (given a powerful syn-drum overhaul), The Names' "Calcutta" (excerpts of more syn-drum noodlings and synth hook-line tinkering) and his own "The Music Room" and "First and Second Aspect of the Same Thing" flexi tracks, the latter already available in more-polished form on the "From Brussels With Love" and "Return of the Durutti Column" reissues. It might have been nice to see the band's name-checked in the sleeve notes or track listing, but I guess it's cheaper not to. 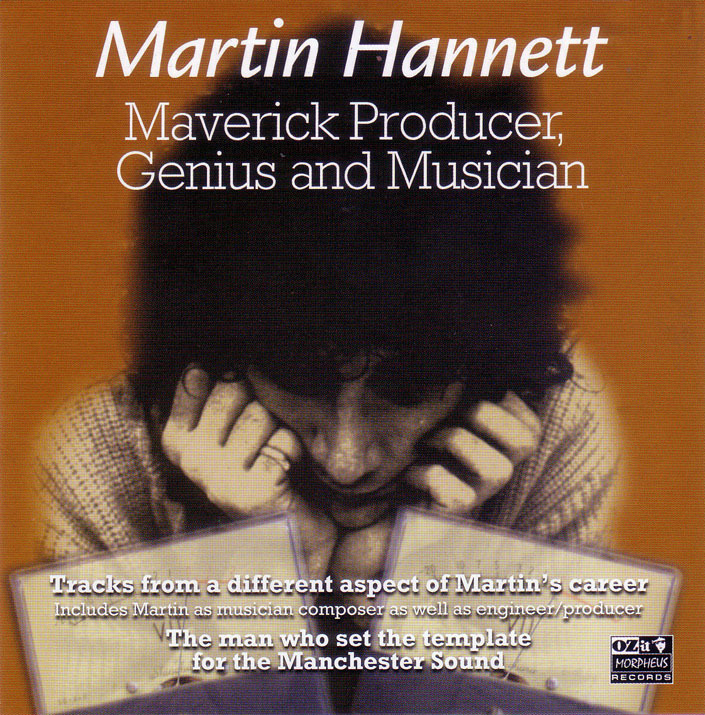 "Martin Plays Bass" is exactly what it says and offers up the only fully unreleased solo Hannett ephemera of the man busying himself with a bass-guitar and a tribal drum-track - you wonder where he went with this idea, it's rather engaging. Whilst the sound-quality on these discs is questionable, you have to remember that much of this is in excess of 30 years old and produced at a time when Trevor Horn (Hannett's closest rival) was eyeing up his next piece of technology for his band The Buggles, only to beat Hannett to the ultimate studio toy a few years later - the coveted Fairlight. If you've already become familiar with the likes of the sonically-superior works of Joy Division, Section 25, The Names, Happy Mondays' "Bummed" and early New Order and want to explore the bottomless barrel of a genius at work, "Maverick..." is for you. The hiss is essential.